How are La Niña, El Niño and Normal conditions seen in Pacific Ocean Surface Temperatures? These are normal ocean surface temperatures in the equatorial Pacific Ocean, with warm water along the equator in the western Pacific Ocean and cooler water along the equator in the eastern Pacific Ocean (below). 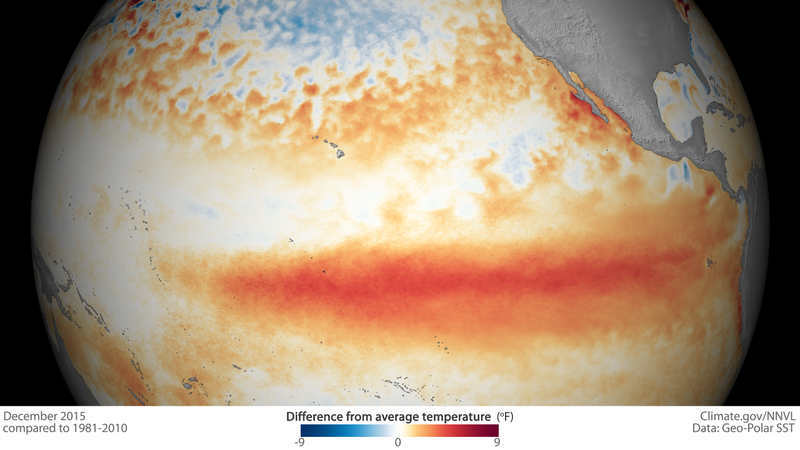 El Niño is characterized by unusually warm ocean temperatures (red and orange) all along the equator in the Pacific Ocean (below). La Niña is characterized by unusually cold ocean temperatures (blue) along the equator in the eastern and central equatorial Pacific Ocean (below). The above graphics show monthly sea surface temperature in the equatorial Pacific(20ºN-20ºS, 100ºE-60ºW), provided by the TAO project and created by Dai McClurg. The banner graphic at the top of this page shows global ocean temperature difference from average for December 2015 compared to 1991-2010 and is from climate.gov/NNVL.